Doreen Hornsblow wrote as Sally Wentworth. Doreen was born in Watford, Hertfordshire, England, UK. She married with Donald Alfred Hornsblow, with whom she was a son Keith, in 1968, the family lived in Braughing, England. Doreen began her publishing career at a Fleet Street newspaper in London, where she thrived in the hectic atmosphere. 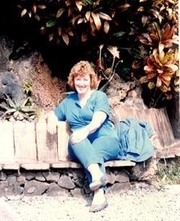 She started writing after attending an evening class course and sold her first novel to Mills & Boon's in 1977, she published her novels under the pseudonym Sally Wentworth. Her novels were principally set in Great Britain or in exotic places like Canary Islands or Greece. Her first works are stand-alone novels, but in 1990s, she decided created her first series. In 1991, she wrote a book in two parts about the Barclay twins and their same great love, and in 1995, she wrote the Ties of Passion Trilogy about the Brodey family, that have money, looks, style, everything... except love. Doreen was accounts clerk at Associated Newspapers Ltd. in London, England, and accounts clerk at Consumers' Association in Hertford, England. In 1985, she was the founding chair ot the Hertford Association of National Trust Members, and named its life president. She also collected knife rests and she was member of The Knife Rest Collectors Club. Doreen Hornsblow died from cancer in 2001, at 64 years. Sally Wentworth is currently considered a "single author." If one or more works are by a distinct, homonymous authors, go ahead and split the author. Sally Wentworth is composed of 2 names. You can examine and separate out names.